What is a root canal? Does it hurt? Do I need a root canal? These are common questions asked by patients. At Weldon General & Cosmetic Dentistry, we are dedicated to educating all within reach about topics in oral healthcare and dentistry. As a result we have answered some frequently asked questions below regarding root canals. 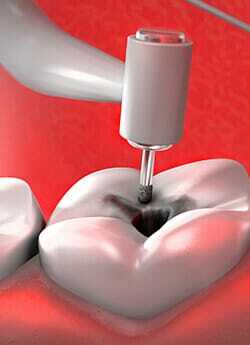 The segment of dentistry dealing with root canals is termed endodontics. A root canal is a common dental procedure performed to save a tooth when inner material, called “pulp,” becomes infected and causes pain, sensitivity, infection, and/or swelling. When performed in time, a root canal can save a tooth from further decay and removal. In most cases, root canals can be done non-surgically by removing the diseased pulp and cleaning and sealing the root canal. Even though the normal source of vitality including blood and nerve supply has been removed from the tooth, it can remain in the oral cavity and save the patient from more expensive and invasive alternatives like dental implants and dentures. The dental pulp is a complex segment in the center of the tooth that includes nerve, blood, and lymphatic supply. The pulp extends down the root canal of the tooth through an opening into the jawbone called the apical foramen. The nerves and blood vessels pass through this opening. The pulp is essential to the life of the tooth. It provides developmental, sensory, and vitality functions. Why Would the Pulp Need to be Removed? Pulp needs to be removed when it is irreversibly infected or dead. The source of infection can be from decay, trauma, gum disease, or a combination of these. This infection if neglected can spread and cause swelling in the face and neck, bone loss around the root, and drainage problems. Infected pulp should be removed as soon as possible. How Would I Know if a Root Canal is Needed? Your dentist is the only one who can properly diagnose the problems that would require a root canal to be performed. There are many signs and symptoms that can also be indicative of other problems. Possible signs would include but are not limited to toothache, pressure, sensitivity to heat or cold, or swelling of the gums. First, x-rays are taken to help determine the severity of the problem and the shape of the canals. A series of files of increasing diameter are utilized to clean out the infected tissue within the pulp chamber. After the root canals are cleaned out thoroughly, the canal is then sealed. Finally, a tooth that is requiring a root canal often also requires a restoration. A crown, a crown and post, or other restorations are often utilized. If not done, often the tooth is susceptible to fracture in the future. Dentistry has evolved significantly in many of our lifetime’s. In the past, many procedures that are routine now were complex and caused pain to patients. Root canals now can be a routine procedure. The dentist will thoroughly anesthetize the tooth that will be operated on so the procedure itself will be painless. Some patients will experience slight post operative sensitivity but endodontics by nature is not painful.